Soleri, one of the few remaining direct disciples of Frank Lloyd Wright, actually saw few of his projects built. But his exalted manifestos on a revolutionary lifestyle of complex but compact cities where cars are not needed and more of the natural landscape is preserved made him one of the most recognized names in architecture and design. Few of his projects have been built, but it was his exalted manifestos that made him one of the most recognized names in architecture and design. “If you are truly concerned about the problems of pollution, waste, energy depletion, land, water, air and biological conservation, poverty, segregation, intolerance, population containment, fear and disillusionment: Join us,” says the poster at Arcosanti’s entrance. Just off Interstate 17 in Cordes Junction, Arcosanti is an urban project that explores the possibilities of future city life in concrete and steel. Soleri envisioned more than 5,000 people living in the complex. 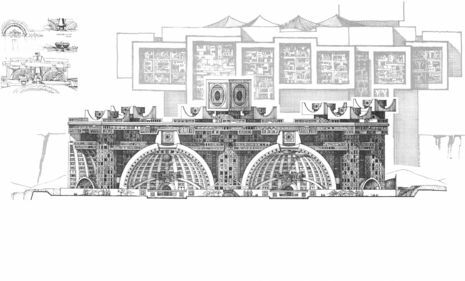 It never achieved Soleri’s full vision, though it continues to operate and evolve with his goals in mind. Soleri’s impact can also be seen — and heard — across the Valley. Among his completed projects is a $3.5million pedestrian bridge in Scottsdale, Soleri Bridge and Plaza, southwest of Camelback and Scottsdale roads. It is the only completed bridge of the hundreds he designed. 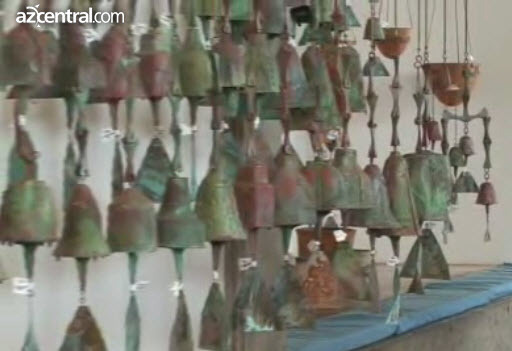 And thousands of Valley residents treasure their “Soleri Bells,” unique cast-bronze wind-bells that are prized for their purity of tone. Soleri began designing and selling them half a century ago to finance Arcosanti. Valley architect Will Bruder likened Soleri to Leonardo da Vinci, the prolific Renaissance painter, sculptor and architect, for his breadth of work on paper and his influential ideas. Bruder, who came to Arizona to work with Soleri in 1967 and 1968, spent last Wednesday morning visiting Soleri at his home in Paradise Valley, where he had taken to staying in bed. “Paolo taught me about the ordinary becoming extraordinary,” Bruder said. He added that the celebrated architecture of Burton Barr Central Library in Phoenix, which Bruder designed, would not have come about without Soleri’s input on materials and design. “We must build up, not out,” Soleri told The Arizona Republic in 2011. Soleri received his first commission with architect Mark Mills in 1949 from heiress Nora Woods to build the “Dome House” in Cave Creek. He married Woods’ daughter, Colly, the same year. They had two daughters, Kristine and Daniela. Colly Soleri died in 1982. 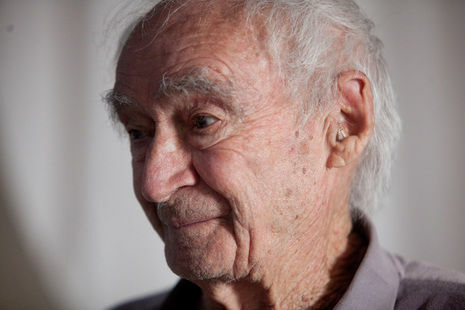 Born in Turin, Italy, Paolo Soleri returned to his home country in 1950. There, he studied solar energy and completed several architectural commissions, including a lauded sculptural-ceramics factory on the coast south of Naples. He returned to Arizona in 1956, the same year he founded the Cosanti Foundation. “Cosanti” combines the Italian words, “cosa” (things) and “anti” (against). Soleri distrusted affluent suburbia. 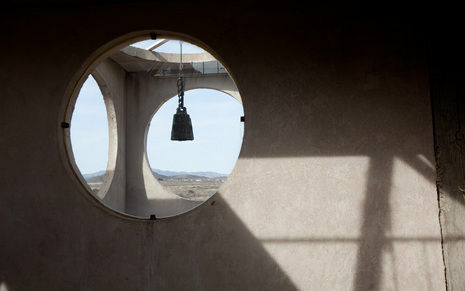 But as the Valley grew, urban sprawl surrounded his Paradise Valley home — a 5-acre compound called Cosanti. Cosanti has grown amid the paloverde trees, mesquite, prickly pear and saguaro. A collection of concrete domes set into the Earth dot the property at 6433 E. Doubletree Ranch Road. It also features a foundry that produces the famous Soleri Bells. Each is cast in bronze or clay and is unique. Ranging in price from $29 to $3,000, they have been the main financial support for Soleri and his projects. Implementing Wright’s idea of using apprentices, people work at the foundries at Cosanti and Arcosanti pouring about 600 pounds of molten bronze a day into the sand molds to make the bells. 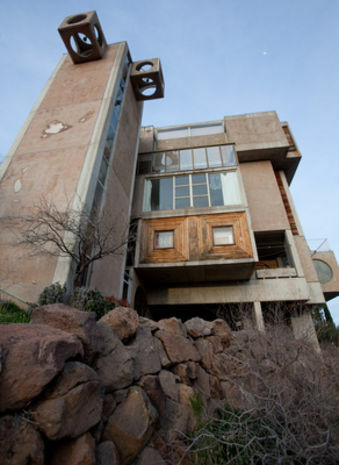 Until recently, Soleri had divided his time between the weathered, wood-frame house on the Cosanti property and his Arcosanti creation north of the Valley. Soleri began constructing Arcosanti in 1970 on 860 acres of desert outside Phoenix. But no one could ever judge the experiment because the honeycomb buildings are less than 5 percent complete, and only 55 people reside there. Stein said that though Soleri was disappointed Arcosanti wasn’t more realized, he did have patience in the process of building sustainable life in a new city. 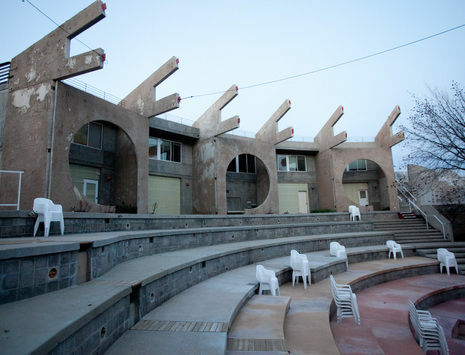 Arcosanti is not an “instant culture,” he said, created by resort developers flush with money. “So, 40 years ago, where I’m talking right now was a mesa top,” Stein said from Arcosanti. “In another 40 years, it will be transformed that much more. Forty years ago, Phoenix didn’t seem like much, and in the first 40 years, neither did Tokyo or London or Chicago. One project, completed through what Soleri called “no pushing or pulling” of his own, was the Soleri Bridge and Plaza. At $3.5 million, the bridge was the largest project ever undertaken by Scottsdale Public Art, the city-subsidized group that oversees public-art projects and events in the city. The bridge took 20 years from concept to completion, largely because of financial issues. Dedicated in December 2010, the span was designed as a pedestrian passage and gathering place. The 130-foot-long bridge widens from 18 to 27 feet and opens onto a 22,000-square-foot plaza, which has been a featured setting for several art and tourism events. Most striking are two 64-foot brushed-steel pylons that generate a light beam on the walking surface of the bridge to mark solar events. A second set of 22-foot pylons set in the plaza house Soleri’s cast-bronze bells. The plaza features ten 8-foot-high concrete panels etched with Soleri designs. 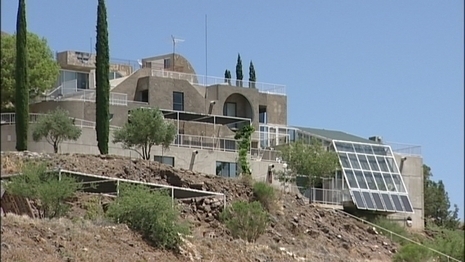 A private burial will be held at Arcosanti, and a public memorial service will be held later this year.